Interest in the anchoritic life in Europe, and medieval England in particular, has never been greater. And yet almost all the recent discussion tends to concentrate on the same texts – De Institutione inclusarum and Ancrene Wisse. Considerations of gender and anchoritism have been limited by the assumption that the reclusive life was ‘a feminine phenomenon’ pursued almost exclusively by women. 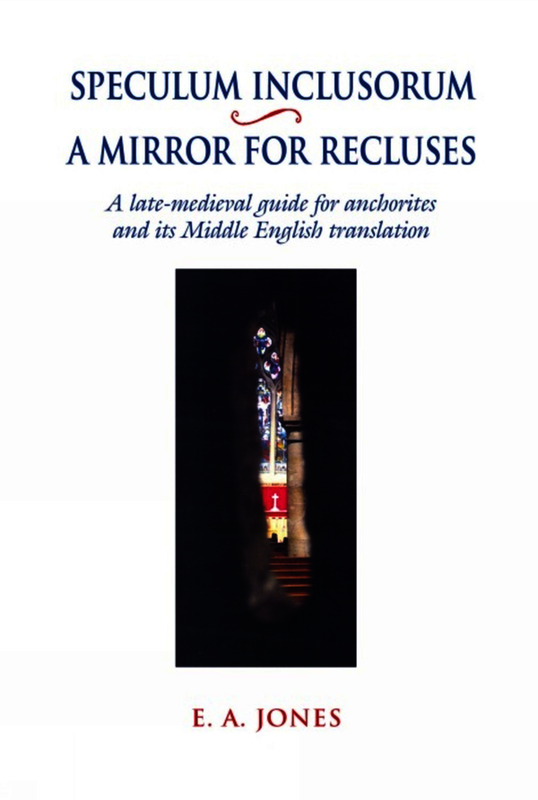 This critical edition of a late-medieval English ‘rule’ for male anchorites will be a timely intervention in – and stimulus to – an already exciting field. The Speculum Inclusorum is an early 15th-century Latin rule or guide. It is notable particularly for the careful attention it gives to discernment and the probation of the prospective anchorite’s vocation; for its frank discussion of the temptations and dangers of the reclusive life, including sexual sins; its deep consideration of the anchorite’s spiritual life of prayer, meditation and reading; its anticipation of the joys of contemplation that await him; and the ecstatic quality of some of its writing. The Speculum is a work of considerable interest in its own right. Within a decade or two of its original composition it was translated into English in order to adapt it for a readership of female anchorites. This book will give the first opportunity to compare Latin and English versions of the rule, the one intended for male and the other for female anchorites. It is the first edition since 1913 of this fascinating and important text but the first English-language edition and the first complete English translation to be published. It will be an important contribution to the ongoing debates about spirituality and religious institutions in the post-Wycliffe, post-Arundel church. Eddie Jones is Senior Lecturer in English Medieval Literature and Culture, University of Exeter. His research interests include late medieval English religious literature and culture, especially the ‘non-regular vocations’: hermits, anchorites, vowesses, the ‘Mixed Life’; the ‘Middle English Mystics’; and intersections of the literary and the historical, the religious and the social. This edition, as one would expect from the leading authority on English anchoritism, draws on a broad and deep knowledge of the anchoritic tradition. The Introduction is particularly valuable---wide-ranging, thorough, and illuminating, it convincingly places the anchoritic works it discusses in their broader historical, institutional, and spiritual context. The discussion of the dating of the Speculum, which makes a case for Carthusian composition and places it in the second decade of the fifteenth century rather than, as previously assumed, the fourteenth century, is detailed and persuasive. E. A Jones is Senior Lecturer in English Medieval Literature and Culture, University of Exeter.